The Montreal Impact unveiled Friday the visual identity of its new primary adidas jersey, in front of its club members and supporters as part of its 2019 season kickoff event. 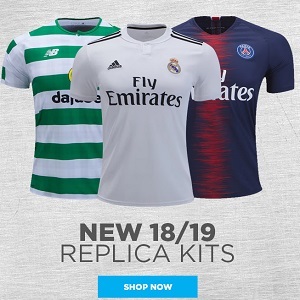 The new kit will be available at the MLS sections of soccer stores World Soccer Shop, Kitbag, Pro:Direct Soccer and UK Soccer Shop. Very focused on the colour black, a novelty this year and a first since arriving in MLS in 2012, the Monreal Impact 2019 adidas home jersey incorporates blue, gradient modern lines, representing both the Bleu-blanc-noir’s heritage and future prospects, which the beginning of this second quarter-century represents for the Montreal club. Also, the round and buttoned collar, refined, gives the current jersey a more retro feel. The famous North Star Bell, property of the 1642 Montréal supporters’ group, who make sure the bell resonates after each goal and victory at Stade Saputo, is featured on the shirt for the very first time. In the back, on top of the players’ names, we find the heraldic cross, usually featured on the flag of Montreal, around which the letters IMFC are enshrined. The logo of the Inpact’s presenting partner, BMO Financial Group, will continue to be the focal point of this new jersey, thanks to a new long-term deal officialised last October 24. The Bleu-blanc-noir will head back to Florida, in St. Petersburg, as of Monday for the second portion of its training camp and will play three preseason games, against Philadelphia Union on Saturday, February 16 at 4pm, the Tampa Bay Rowdies on Wednesday, February 20 at 7pm, and D.C. United on Saturday, February 23 at 7pm. The Montreal Impact will then kick off its regular season against the San Jose Earthquakes on Saturday, March 2, at 10pm EST at Avaya Stadium. The Impact will open its season at home, at Stade Saputo, on Saturday, April 13, at 1pm against the Columbus Crew SC.